At the end of last month, the Consumer Federation of America came out with a report that basically says oil companies are holding up the expansion of ethanol. However, “Big Oil vs Ethanol” has received virtually no press coverage. Interesting. CFA is an advocacy, research, education, and service organization that has been around since 1968 and is credible enough that the media has been known to use its opinions on other matters – but not in this case. consumers have a large stake in the outcome of the war being waged by Big Oil against ethanol. Supporting increased competition in the automobile fuels market will help discipline a market dominated by a handful of multinational oil companies that are extracting monopoly profits from US gasoline consumers. 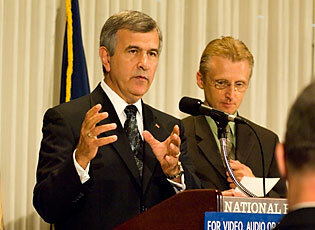 Is the media as threatened by ethanol as Big Oil seems to be? I know Chuck already did a post on the Iowa “Popcorn Propaganda” event, but here are my thoughts to add, along with another picture. 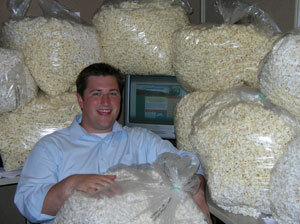 This is Iowa Corn Promotion Board intern Paul Brees with the fruits of his six hours of labor – 38.5 pounds of popcorn. The purpose of Paul’s popping project was to point out to the press and the public that pinning popcorn prices on ethanol production is pure poppycock. The Iowa photo-op did generate some publicity. The Associated Press story headline reads, “Ethanol Makers Join Food vs. Fuel Debate.” The story was good, the facts were right, the ending comments from the Jolly Time popcorn people fell pretty flat, but the headline was all wrong. It makes it sound like all of the sudden the corn and ethanol industries woke up and decided to defend themselves. The media just hasn’t been listening. Here is a link to the popcorn facts sheet from the Iowa Renewable Fuels Association that provides some points for the media to ponder. Among them … that tub of popcorn at the movie theater contains .15 pounds, or 2.4 ounces, of popcorn kernels prior to popping. And that five dollars worth of popcorn from the farmer filling all those trash bags would translate to about $1280 at the movie theater. 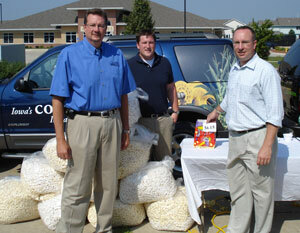 By the way, in case you were wondering what happened to all that popcorn, Mindy Williamson with Iowa Corn says they donated it to local daycares and two homeless shelters. Not bad for a $5 investment! QUESTION: Corn-based ethanol may help the nation reduce its dependence on foreign oil, but critics say that ethanol costs almost as much as the energy it produces. Isn’t corn-based ethanol a wasteful way to produce energy, and won’t it increase the cost of food? SEC. JOHANNS: No, and it isn’t. We studied that a lot at the USDA, and years ago when the plants were not as efficient, when ethanol was barely used in our country, there were a lot of articles about the inefficiency of producing ethanol and all the energy, etcetera. We’ve debunked that in our studies. We’ve put that issue to rest. Independent studies have looked at the same issue. You very definitely have efficiency here. The other thing I will tell you, in the United States we’re going to grow corn. We just simply are. We do it very well; we do it better than any country in the world, and our farmers are going to grow corn. And I think it’s important that we do everything we can to create a marketplace. Let me offer a thought, and we’re talking about maybe an address that really gets down to this issue of food versus fuel. Every year we have some inflation relative to food, 2 percent, 3 percent, somewhere in that vicinity, some years maybe a little bit more, a little bit less. This year with all of this debate raging we anticipate that food prices across the board will be impacted 2 to 4 percent, about average, maybe a little bit higher. Then when you look at that, many articles I read see that and then they go right to the conclusion, it’s because of ethanol, it’s because the price of corn got high and that’s the reason. They leave out a whole big piece of the analysis. What’s the big piece of the analysis? The farmer doesn’t get all of that. I’m sure they wish they did. But they get about 20 cents of the retail dollar. Actually the increase in the price of energy to ship that food can have as much or more of a profound impact on the price of that food than the corn you feed to the animal. I’m just telling you, this is a very, very complicated supply chain. And if you have reached the conclusion that because food is up 3 percent this year or 4 or 2 or whatever it is, that that’s because of ethanol, and you’ve missed all of that, you’re not telling the full story. And you’re not telling an accurate story, in all due respect. We have the accurate story at the USDA. We study this all the time. We buy or provide money for nutrition programs, so of course we want to know what the price of food is doing. And anybody who wants to write an in-depth article on that or do a series on it, we’d love to provide you with the information on just how complex the food chain is and how impacts in that food chain relative to fuel to transport it, or to promotion costs or whatever it is, can actually have a more important impact on the cost of that food than the price of bushel of corn. A state corn growers organization decided to use a picture to make a point on how out of control the food vs. fuel debate is getting. The The Iowa Corn Promotion Board (ICPB) and the Iowa Renewable Fuels Association (IRFA) got together for a joint press conference and photo-op to dispel claims that ethanol and higher field corn prices result in higher popcorn prices for moviegoers. The “Popping the Popcorn Propaganda” event clearly illustrated this point by displaying what $5 will buy you at a movie theater versus $5 from a farmer. “The ‘blame ethanol’ game has gotten completely out of control,” stated IRFA Executive Director Monte Shaw. “From a consumer standpoint, for $5 you can buy 1 tub of popcorn at a movie theater or 38.5 pounds of popcorn from a farmer, which, when popped fills nearly a dozen 33-gallon trash bags. To illustrate the point, IRFA intern Paul Brees spent 6 hours popping 38.5 pounds of popcorn – the amount you could buy from a farmer for $5. During the press conference, the 12 bags of popcorn stood in stark contrast to the one small bag of popcorn from the movie theater. Remember all the crying foul by Tyson this spring on the price of corn? Tyson’s earnings have fared well this past quarter despite its repeated stirrings of the food versus fuel debate (pdf). The Financial Times also reports that Tyson managed to have a healthy profit this past quarter–$111 M. Tyson managed to rebound on last years losses by posting a larger than expected profit. The food giant posted a loss of $52 million for the same time period last year. That doesn’t sound like the sky is falling to us! Food and fuel. Corn prices. Ethanol. Farm policy. Issues in agriculture. Welcome to Corn Commentary. We’ll be discussing these issues and more. We hope to have some fun along the way so it’s only fitting our inaugural post is related to the power of viral marketing and ethanol. If you haven’t yet seen the series of ethanol videos on Project Phin, Clean My Ride, Flex My Fuel, you’re missing a great laugh. The star-studded cast touts the benefits of e85, the need for improved ethanol infrastructure and improved mileage standards. Here’s how it got started. You’ll find more on their site. www.cleanmyride.org has all the elements of a strong grassroots campaign. It’s got a strong message, a catchy theme and a call to action. We liked Ben Affleck in “Hollywoodland” and have caught his numerous appearances on Saturday Night Live. However, his role as an ear of corn is truly praiseworthy.